Team Monster Energy Burkhart HMC Racing will kickoff the season on Sunday March 22, 2009 at the SoCal Auto Club Speedway. will be racing factory KTM bikes. Ulrich Toporsch will be crew chief for the team. XTRM Sports Network, the fastest growing online and offline action sports network, announces Troy Lee Designs/Red Bull/Honda rider registrations for the 2009 XTRM AMA Pro Racing Supermoto Championship Series. Veteran Jeff Ward and rookie Joey Pascarella to lead the charge. HMC Racing and Mark Burkhart team up for the 2009 Supermoto Season. 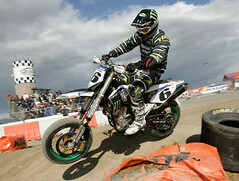 2009 will be Mark Burkhart’s seventh year competing in Supermoto. He has participated in every AMA Pro Racing national event since the inception of the series in 2003. The new team, Monster Energy Burkhart HMC Racing, will kickoff the season on Sunday March 22, 2009 at the SoCal Auto Club Speedway. Both the XTRM AMA Supermoto and AMA Suzuki Superbike races will be happening the same weekend! So the battle is on with asphalt ripping side-to-side motorcycle racing action… Just a month away. Palo Alto, CA, March 6, 2009– XTRM, AMA Pro Racing and Auto Club Speedway are pleased to announce the schedule for the kick off to the 2009 XTRM AMA Pro Racing Supermoto Championship Series and 2009 XTRM AMA Amateur Supermoto Championship Series. This year the Supermoto event kicks off with a large bang at Auto Club Speedway for all motorcycle fans. Both the XTRM AMA Supermoto and AMA Suzuki Superbike races will be happening the same weekend! Get ready for high-speed thrills and side-to-side motorcycle racing action as the starts of Supermoto and Superbike battle it out. XTRM Inc. is the fastest growing online and offline action sports network. XTRM provides huge value for sponsors, advertisers, properties, event organizers, athletes and fans. XTRM is headquartered in Belmont, CA with distribution throughout the United States and Europe. For more information, please visit www.xtrm.com or call 866.367.9289.